Being a fully licensed home inspection company, we have everything needed in order to properly assess a property you have chosen to buy. We will help you detect any issues that might come to the surface after you have bought your new home. Many first time buyers are not familiar with what procedures need to be done before they purchase a property, and most of time they suffer because of this. Stephen Wisneski & Associates has been in the local trade for many years, and knows what details to look for in every evaluation. Our home inspectors are dedicated to their job, and guarantee your full satisfaction. My father decided to buy a house for me and my wife as a wedding present; however, he told me to look for a professional who could take a look at all systems of the residence. After going through a number of home inspectors, I found your company to be recommended by many people. Your service and report were outstanding! Thank you very much! I wanted to buy a home that looked absolutely amazing. My brother, however, advised me to have it inspected first because he thought that the price was too steep. After looking for a specialist who performed home inspections, I found you. I am so glad that I called you - if I hadn't, I would never have found out that this house needed expensive plumbing and electrical repairs! You saved my budget, thank you! My real estate agency always looks for quality properties; however, the business has taught me to always make sure that what I am about to purchase is worth it. 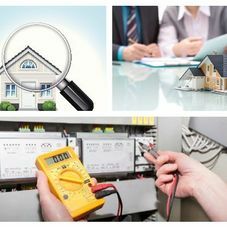 In one particular case, a client had not evaluated his house, and I started looking for someone with qualification and experience who specializes in home inspections. Your company performed an outstanding service, and I am looking forward to working with you again!